With such a large summer population and over 550 miles of shoreline, boating Cape Cod is a popular pastime. Boating conditions on the Cape can run from the sheltered bays to the slightly more exposed areas of Cape Cod Bay and Nantucket Sound, to the extremely exposed, unforgiving, mighty Atlantic Ocean. Care must be exercised when enjoying the waters of the Cape on a boat. Be sure to always have the proper safety equipment, be aware of the rules of boating, and always…always…did I say always…keep an eye on the marine weather. Boating Cape Cod does not necessarily require you to own a boat. If you have a little experience and would like to tackle the waters of the Cape on your own, there are a number of companies offering Cape Cod boat rentals. We personally have rented from Ship Shops in Yarmouth and we were very happy, both with the quality of the boats and the very friendly and helpful staff. We rented a 24′ Boston Whaler complete with all the necessary safety equipment and our family of five had an amazing time on Nantucket Sound. The boat was equipped with a GPS(global positioning system) which made it virtually impossible to get lost. As you travel, you leave a trail which is shown as a green line on the screen. When it is time to return to port, you simply follow the line back. There are also routes pre-programmed that you can follow, to Hyannis, for instance…Very Cool! If you own a boat, you can find all of the services that you need right around the corner, no matter where you are staying on the Cape. If you trailer your boat, there are Cape Cod boat ramps in every town. If you need marine supplies or perhaps repair or maybe a place to refuel, Cape Cod has over 40 marinas to serve all of your Cape Cod boating needs. 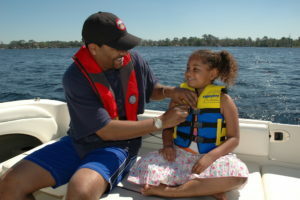 Maybe you would like to enjoy boating Cape Cod, but you don’t know the first thing about handling a boat. There are numerous Cape Cod cruises available that will allow you to kick back and enjoy the waters of the Cape without having to worry about a thing. Of course, if you are like me, being on a boat is synonymous with fishing. What better way to enjoy the waters of the Cape than to spend a day fishing on a Cape Cod charter fishing boat. If you do decide to explore the waters of the Cape on your own, you need to know what to expect. Let’s start with Cape Cod Bay. Cape Cod bay is the body of water to the north and west of the Cape. It is accessed from the Cape Cod canal or any of the Cape’s north side harbors. It is much like a large bowl with a very gradual slope and a large tide fluctuation, making it nearly impossible to launch a boat in anything but the top 3 hours of the tide. Be sure to know the water around you on a falling tide or you may find yourself stranded and waiting for the tide to return. Any of the local Cape Cod marinas can supply you with navigational charts. Familiarize yourself with the waters that you will be visiting before you go. Prevailing winds on the Cape are southwest, which means that the Bay is on the lee side of Cape Cod and therefore protected. Be aware of the wind changing to a northerly direction, this is when the bay can get ugly in a hurry. To the south of the Cape are the waters of Nantucket Sound and Buzzards Bay. These bodies of water are accessed from the south coast harbors and are accessible on all tides. These are fairly protected waters, but as always, while boating Cape Cod, keep your eye on the weather(did I say always!). Martha’s Vineyard and Nantucket are just a short trip across Nantucket Sound. This can be a great day trip for the whole family, whether you take your own boat or one of the Cape Cod ferries. The last major body of water to consider when boating Cape Cod is the Atlantic Ocean, and I truly hope that you will give it much consideration and be sure that you are over prepared. The Atlantic is absolutely unforgiving and one of the most powerful entities known to mankind. Have I scared you away yet? That is not my intention, I simply want you to understand that being prepared for anything that comes your way while enjoying the “big pond” is essential. The Atlantic can be accessed from any of the eastern harbors of the outer Cape, from Chatham to Provincetown. If you have any doubts about your ability to handle the rough seas that can be found at the access points, please do not attempt to negotiate them, and always…always…did I say always…keep your eye on the weather! There are many other bodies of water on the Cape to enjoy, from salt water estuaries like Town Cove in Orleans and Pleasant Bay to the hundreds of freshwater ponds that dot the landscape. Boating Cape Cod can be a wonderful adventure, whether you are paddling a kayak along a secluded salt marsh in the mist of the early morning, sailing a daysailer in the bay with the mid-day sun warming your shoulders or feeling the adrenaline rush through your veins, sweat beading on your brow, as you fight the fish of a lifetime aboard one of the many Cape Cod charter fishing boats. Get out and enjoy the waters of Cape Cod.